There is evidence to suggest that many teams are currently working through a period of intensified change as the legacy of online mismanagement is finally put right. While local considerations like company culture and internal politics can influence how Governance works, other useful insights on how to structure an effective Web Team are available. What skills are needed to operate this site (based on its Scale)? How much manpower is needed to ensure all operations can be completed to the quality desired? How should roles & responsibilities be assigned among staff? How should they be structured as a team? What overall leadership & control systems are needed to ensure the site can be managed to a high standard and achieve its overall goals? 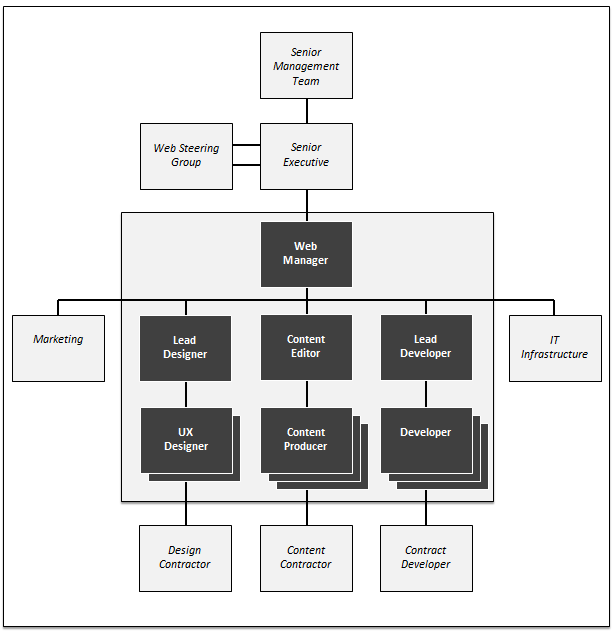 The clustering of roles and responsibilities that may ultimately emerge for a such a site is as shown below. Read "How to build a successful Web Team"